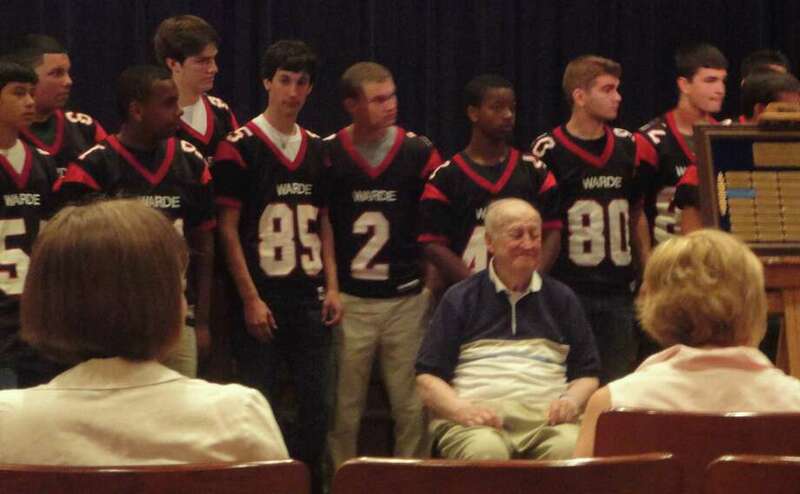 Fern Tetreau, the former football coach Roger Ludlowe and Andrew Warde high schools, is surrounded by current Warde players during ceremonies honoring him as a legend among Warde educators. "Legends inspire and live in us and our students." That was the theme in the Fairfield Warde High School auditorium when the inaugural group of three "legendary" Warde educators was honored recently by the Fairfield Education Association -- two of them posthumously. Honored at the June 21 ceremony were former longtime football coach Fern Tetreau, the late English teacher Charlie Abraham and the late history teacher Jack Strauss. The ceremony was the first of what is intended to be a continuing program to honor exceptional teachers and coaches who spent the majority of their careers at Warde, according to Jim D'Acosta, a member of the education association's Faculty Honors Committee, which established the program. During the recent ceremony, former students, friends and relatives paid tribute to the legends, whose names will be on a plaque as part of a faculty honors display in the Warde media center. The committee had little formal criteria for picking honorees, D'Acosta said. But based on facts and on members feelings, they "knew" Tetreau, Abraham and Strauss should be the inaugural honorees, he said. Known to family, friends, former students and athletes simply as "Coach," the 79-year-old Tetreau was a varsity football in Fairfield from 1953 to 1970, first at Roger Ludlowe High School and later at Andrew Warde. During his 17-year coaching career, colleagues and former players said, Tetreau was compassionate and giving, and taught his players that football provided lessons in life. Before the ceremony, former Warde physical education teacher Ed Bengermino said Tetreau will forever be remembered as a mentor who tapped into the school's tradition. At the ceremony, the coach sat on the left side of the auditorium's front row, Warde's current football team seated behind him. He attended with his son, Fairfield First Selectman Michael Tetreau, who as a quarterback at Roger Ludlowe High School played against his father's teams. During the ceremony, Michael Tetreau said that while his father taught him about football, he taught him more about life. The coach encouraged his children to give back to their community through Thanksgiving charity programs and working for the Special Olympics. "As a kid growing up, I got to be the water boy during the huddle," Michael Tetreau told the gathering. "I got to hear all the big guys, and I got to see my dad coach and [got to] sit in on every single halftime talk. It was a phenomenal experience to see your dad under pressure in a situation like that." A native of Maine, Fern Tetreau had to drop out of high school temporarily to work but returned to school and won a football scholarship to attend college. In brief remarks during the ceremony, he said coming to Fairfield was the best move he ever made. "I was welcomed here, I had a lot of success here, I made a lot of friends and I'm grateful to be around a great community," he said. Charlie Abraham died in 1996 at age 77. As an English teacher, he is remember for the impact he had on students, former student Anne Meiman Hughes said. During the ceremony, Hughes quoted Abraham during one of his English classes: "Yours is the first generation that will have to decide as you stand on this side of the bridge -- the bridge of technology, nuclear weaponry, genetic engineering, computers and such -- whether you should cross the bridge, simply because you can." She said Abraham's influence was felt beyond the subject matter. "He was definitely an inspiration through more than just the subject he taught. He taught [us] to be leaders in the world." Dante Gallucci, a 1976 Warde graduate, told the gathering he was a close friend of Abraham's daughter before she passed away in their middle-school years But he remained close with Charlie. "Although I [gave] little respect to authority in my later high school years, I did give respect to him," Gallucci said. "He said to me, `You know, God gave you a gift. You're a leader, and you're smart. You could either do good things with that, or bad things. I hope you do good things, because this world could use people like you.' "
Gallucci has been a lawyer for more than 30 years, has run the Fairfield National League for 14 years, and been a volunteer coach at Warde for six years. He said that he "couldn't have done it without Charlie Abraham." Jack Strauss taught American history at Warde and died in 1997 at age 67. He was a quiet man at home but quite the opposite in the classroom, according to his widow, Sonia Daniel Strauss. "I understand that when he entered his classroom and shut the door, he was quite dramatic," she said. "Like jumping on the table, or on the desk, or raising his voice, or being very quiet. This was told to me by students who I still hear saying, `Oh my God, I remember Jack. He was so wonderful.' "
When Chris Parisi began his teaching career ay Warde in 1994, Strauss was his mentor. Parisi told the gathering that he and students alike developed a "deep, emotional bond" with Strauss. "His classroom was not a room, per se. It was more of an exciting, ever-changing learning environment," Parisi said. "Jack would put you in his stories, that meandering in the forest of ideas. Frequently, students would be encouraged to be lost in that forest, and I would be lost with him, wondering where it was all headed." Strauss has left an enduring legacy, Parisi said. "His lessons live on in the very lives of his students, including me." Former students and colleagues may contribute testimonials regarding Fern Tetreau, Charlie Abraham or Jack Strauss for inclusion in the legendary educators' archive.